Place the butter, cider or ale, Worcestershire sauce and cayenne pepper into a pan. Heat the ingredients gently until all the butter has melted. Slowly add in the grated cheese. Stir continuously until the cheese has melted and the sauce is smooth and creamy in texture. Do not allow the sauce to get too hot or the cheese will become stringy. Divide the mixture evenly between the slices of hot toast. 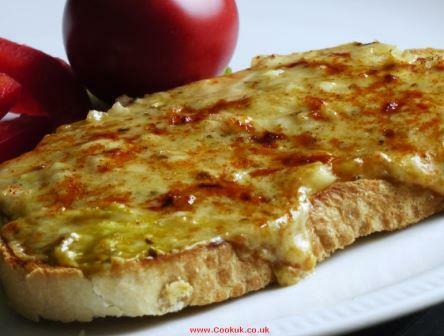 Toast the rarebit under the grill until the cheese bubbles and has started to brown. Serve hot. 4 to 8 pieces lightly toasted ciabatta bread. Preparation 1. Put butter in a saucepan over medium heat and, as it melts, stir in flour. Continue to cook, stirring occasionally, until golden brown and very fragrant, 3 to 5 minutes. Stir in mustard, paprika and cayenne, then whisk in beer and Worcestershire sauce. 2. When mixture is uniform, turn heat to low and stir in cheese, again stirring until smooth. Remove from heat and pour into a broad container to set (you can refrigerate for up to a day at this point). 3. Spread mixture thickly on toast and put under broiler until bubbly and edges of toast are crisp. Serve immediately.